Just like when you are getting over a stomach bug, with chemo, you should eat “gentle” foods, well cooked, that are easy to digest and help you stomach lining to heal. 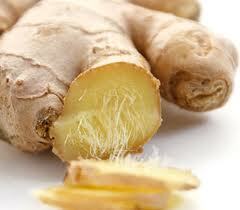 Ginger is one of those magic roots that adds flavor and healing power to your food. The Chinese names for ginger Gan-jiang dried ginger, and Sheg-jiang, fresh ginger, mean to defend, suggesting that ginger helps protect the body from ailments. 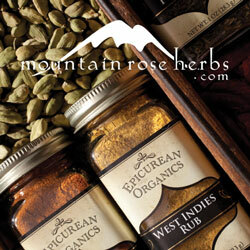 In modern China, ginger is used in close to half of all Chinese herbal prescriptions. Herbalists believe that even modest amounts of ginger in the diet strengthens the lungs and kidneys and has been proven to aid inflammatory conditions like arthritis. I came across this article that states that ginger ale consumption on airlines is always high. One theory among flight attendants is that people have found that it relieves motion sickness and settles the stomach. (During my chemo-run, never was I seen without my Canada Dry in hand!) Researchers agree. There are many ways to “get your ginger on”. 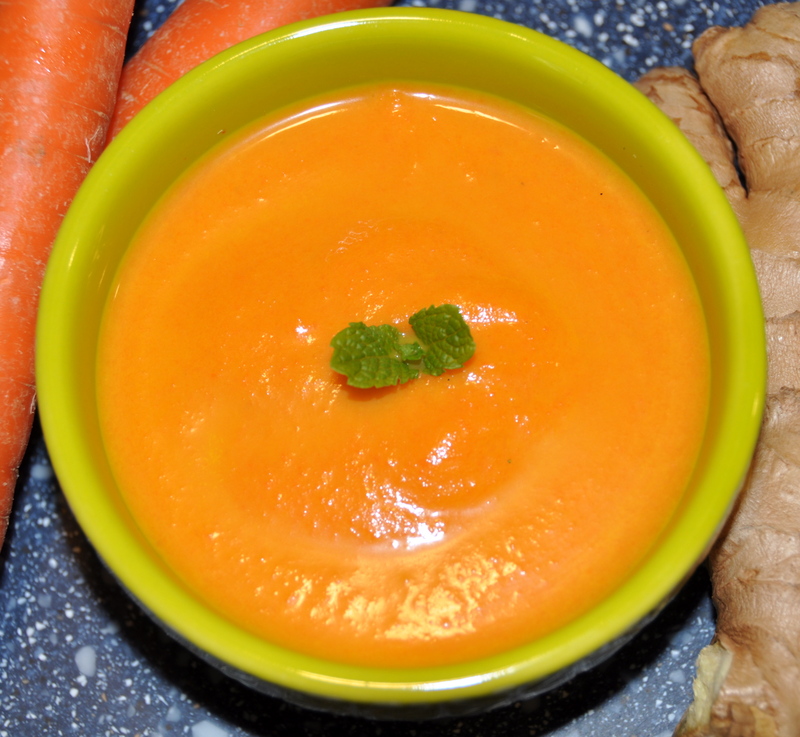 This recipe for Ginger-carrot soup is my all time favorite! This soup is almost too good. It calls for 2 tablespoons of grated ginger, but my palate calls for 3. Ginger has a little bite to it that I love, and the combination of ginger, carrots and just a bit of onion is just about perfect. I also love that I can knock a batch of this out in 30 minutes. Remove from heat, let sit for 10 minutes, and transfer to a blender. Be careful! Don’t fill the blender more than half way. It takes 3 batches to do it this way, but when you are blending hot foods there is a real danger of heat explosion (this happened to me, actually, because I filled the blender too much). 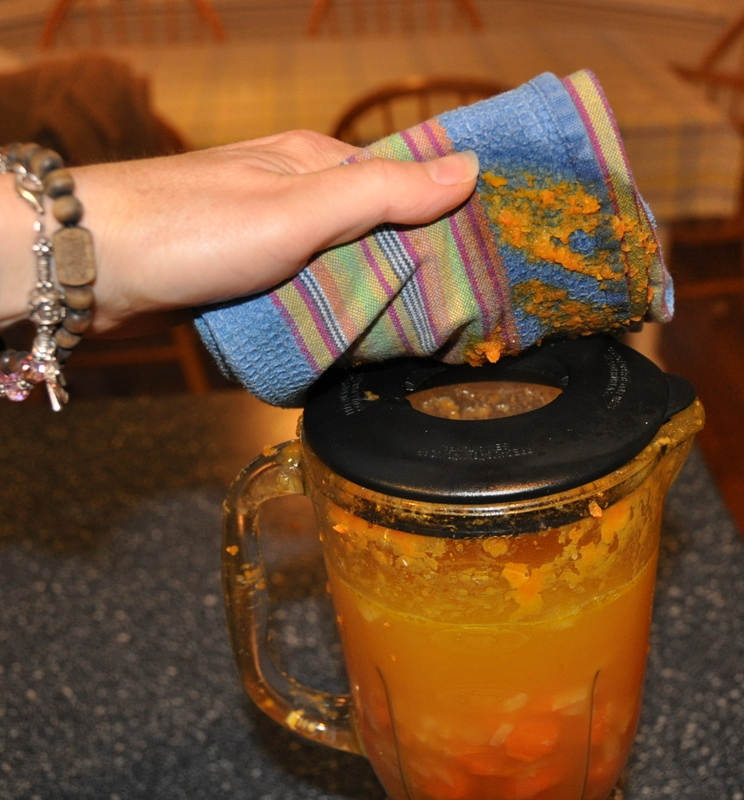 Leave the top open, and place a dish towel over the opening. Pulse the blender a few times before leaving to puree. Puree all contents until very smooth, and return to the pan. You can also do it the easy way and use a hand blender (as suggested by Jayne in the comments). This really works well and you can blend right in the pot! I found this soup tastes better to me when it’s not very hot, just warm. See what you think! 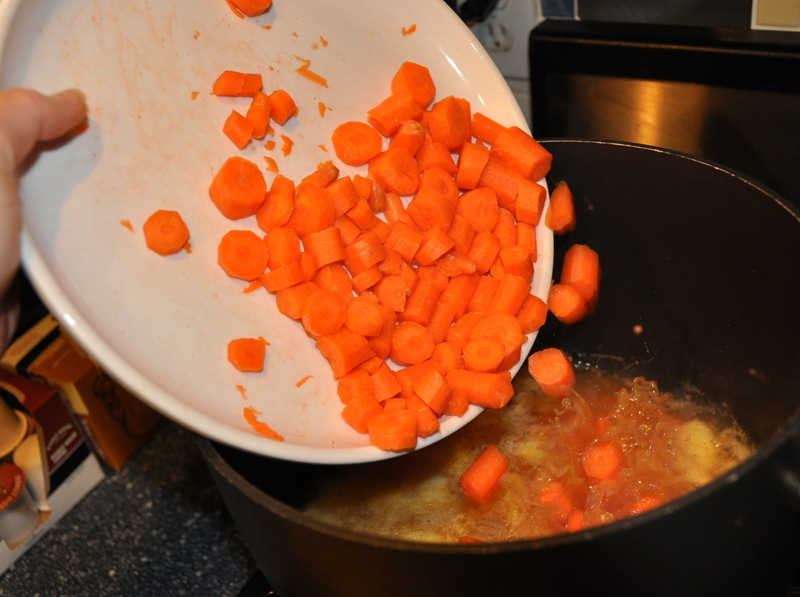 Reduce your sodium to almost zero by making your own broth. Oh, my, this is now my favourite soup. Just made a big pot to freeze. This is a winner! That is a cool recipe and I happen to love carrots. A lot. You’re getting your vitamin A for sure! Will try this one for sure! I’ve exploded hot liquid out of my blender one time to many. Now I use a hand held immersion blender when I’m blending hot soups. 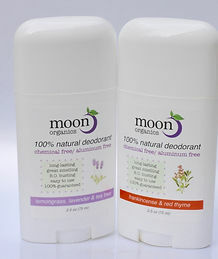 You can get one at Target or Walmart pretty cheap. Great advice! I wish I had used one–it would have saved me a big clean up! Please tell me how he likes it! Thanks for reading! 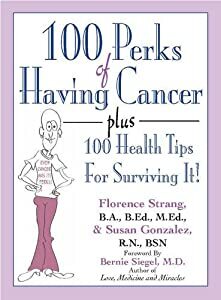 Ginger kills lung cancer & colon cancer cells | Happy Chemo!Happy Chemo!